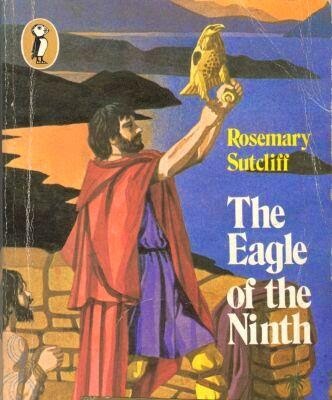 Rosemary Sutcliff explained the dual inspiration for her classic children's novel in the Foreward; the apparent mysterious disappearance of the Ninth Legion (which may not have been a disappearance at all) and the discovery of a wingless bronze eagle at Silchester, which Sutcliff described as a 'Roman Eagle', presumably believing it to be from the standard of the Roman Legion (it isn't, it's the wrong shape - as Reading museum explain). The fact that neither of the 'facts' the story was based on are, as it turns out, true is rather beside the point, as Sutcliff uses them to tell a classic historical children's adventure story featuring several scenes and themes I recognise from reading adventure and fantasy stories from the same period as a child, including secret paths through bogs, wild chases on horseback, mist in the mountains and extremely devoted pets. I have to confess, I struggled a bit to get through this book, but I think that may be my own fault for seeing Kevin Macdonald's 2011 film adaptation The Eagle first. Throughout much of the story, despite dramatic changes in tone and theme, the actual plot of the movie follows the book fairly closely - it's only towards the end that the plot itself starts to diverge, and I found those latter sections easier and more enjoyable to read. Although the book includes some beautiful descriptions of the landscape, both in England and Scotland, it is fairly plot-centric, fast-paced and with enough characterisation to keep things interesting, but not as much depth or detail as some children's books, so I think those parts where I knew the story felt like a bit more of a slog for that reason. While the plot may be superficially similar (up to the point where everyone starts killing each other - after the first battle, no one actually dies during the rest of the novel, except in flashback), the tone of the film and book, and especially Marcus and Esca's relationship, is markedly different. What first attracts Marcus to Esca in the book is not his defiance so much as his fear, which inspires some fellow feeling in him, and Book!Marcus frees Esca before they set off on their quest for the Eagle, so Esca comes and risks his life of his own free will (his duty to serve Marcus as his freedman is mentioned when they return, but Marcus makes it clear he does not want Esca to come unwillingly when they leave for the north). After some initial friction, the relationship between the two is so close that frankly it became almost dull and Esca's devotion seemed a tad extreme - but perhaps I'm just getting old and cynical. I never thought that about Frodo and Sam when I was a child. And Marcus did save his life, after all. The book also presents a more grounded view than the film of the lands north of Hadrian's Wall and of Britain and the Britons in general. The existence of the Antonine Wall is acknowledged, and one set-piece takes place in an abandoned Roman watch-tower between the two, in what was briefly a Roman province. Although the various British tribes have their own cultures and ways, there is much more emphasis on all humankind's similarities. The tragedy of the rebellion that wounds Marcus is that he and the doomed leader were friends, similar men with similar interests who ended up on opposite sides. When Marcus and Esca travel north, they do so in disguise, since they know Romans won't be welcomed, and they spend time with the tribe who have taken the Eagle and get to know them (there seems to be one language called 'British' that Marcus is remarkably good at speaking, but we'll let that go). Marcus is initiated in the cult of Mithras. Mithraism is very useful to authors for a couple of reasons. It shares several superficial similarities with Christianity, in some cases because Christianity co-opted elements of Mithraism. Mithras was a sun-god and the religion is also associated with the Moon. Although originating in Iran, the cult was especially popular in the Latin West of the empire and among soldiers. The focal part of Mithras' myth involved killing a bull and a fresco in a Mithraeum at Santa Prisca reads 'you saved us with the shed blood' (probably the bull's blood). There was probably some kind of Mithraic festival around the winter solstice as well, given that he was a sun-god. But most usefully of all for authors of fiction - we actually know very little about the cult, because it was a secretive mystery cult, only known to initiates, who were forbidden to write anything about it down. Nearly all the evidence for the cult is archaeological, and not heavy on text, so we're interpreting images without context as best we can. That's a goldmine for authors, who can pretty much make up whatever they want and claim it's historically plausible. It's perhaps not surprising, then, to find Marcus following a heavily Christianised form of Mithraism (and hardly ever referring to the other gods, always praying to Mithras). The language he uses to pray is that of the King James Bible, using archaic 'thees' and 'thous' and saying things like 'O God of the Legions... send down thy light upon us.' Logical enough for a sun-god, but clearly Christianised. There's a tension between referring obliquely to the exotic Roman mystery cult and its mysterious initiation ceremonies, and presenting that religion to 1950s child readers (presumed Christian, or having had a Christian upbringing anyway) as something familiar and identifiable. Although I found it a little slow going at times (despite the fairly fast-paced plot) I enjoyed this book, and I'm sure I'll go on to read the others in the series. Although many of the characters are fairly lightly sketched, they're all likeable, and there's even a female character in there, which is nice, even if she doesn't get to join in the adventure. There's a dry humour throughout the book too, and the setting and landscape are richly drawn. I wish I could love it as much as I know many of my colleagues do, but I think that just comes down to when you read it. Much of the book reminded me of Narnia and The Lord of the Rings, right down to the sound of horns and trumpets heralding the arrival of the cavalry or a desperate chase on horseback through dangerous terrain. I suspect if I'd read it as a child, and without seeing the movie, I would have loved it as much as I know many others do.